The 2000W heater is capable of rapidly heating these water baths to +100°C, while the temperature stability of ±2°C gently takes care of samples. temperature testing of food and luxury articles. a splash-proof mains switch and tactile keypad for added safety and convenient control. 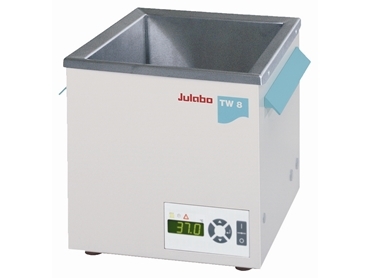 The TW series water baths offer a small footprint and utilise a powerful microprocessor controller with LED to display actual temperature, setpoint, high and low temperature warning values, as well as a digital timer. Accessories available for the TW series water baths include clear Makloron covers, test tube inserts and liquid level controllers.